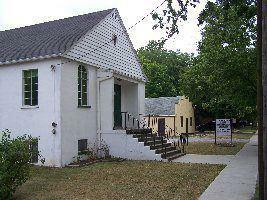 The West Unity Free Methodist church was an outgrowth of the Montpelier FM church in the early 1950’s with the Sunday School classes being held at a private home at first. They eventually moved to the building east of the post office. The first service in the newly built church at 603 W. Jackson St. was December 1953. The church was designed to meet the individual needs of the whole person, and it has always been the primary objective to reach out to the community in friendship, caring concern and love. Some of the Pastors over the years have been Charles Sickmiller, Ray Altman, Walter Orr, Erwin Berhens, Nick Woodall, Mike Childs, Jim Williams, Peter Kadar, John Wommer, and the present Pastor Dave Mathis. In April of 2012 a new building was completed and April 30th and May 1st we moved our congregation to our new location at 1051 W. Jackson St. 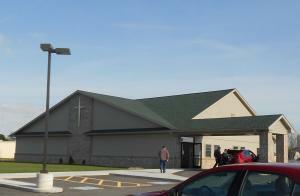 The church was built by Scherer Construction company using all local sub-contractors as well as Cornerstone Flooring of Pioneer for kitchen cabinets, and all flooring throughout the building. A crew of church members did all the painting and cleaning as well as writing scripture on the concrete floor before the flooring was laid so that every step we take in the building is under laid with God’s word. The platform area of the church has the original altar and communion table that was refinished by Dave Rummell. The Oak crosses in the center peaks of the fellowship room were made by Terry Scherer. The office furniture was donated by Sauder Woodworking. This is the first phase of the architectural design. As the church grows and is able there will be an addition to the north of the church that will be a permanent 300 seat Sanctuary for worship. The overall existing building is for multi-purpose activities to best serve the ministries of this church.